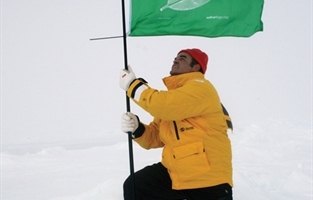 XAVIER CORTADA / "Participatory Eco-Art Projects"
Home > Fiscal Sponsorship > Project Directory > XAVIER CORTADA / "Participatory Eco-Art Projects"
XAVIER CORTADA/ " Participatory Eco-Art Projects" In 2008, Cortada planted a green flag at the North Pole (90N) to "reclaim it for nature" and launch a global reforestation ecoart effort to help slow the polar thaw. He also performed ritualistic installations to address global climate change and mass biodiversity loss. Cortada will further develop and innovate the three participatory eco-art projects so that cultural, science and educational institutions can use them to engage audiences in addressing environmental concerns. XAVIER CORTADA/ "Participatory Eco-Art Projects"
Miami artist Xavier Cortada will work to transform the three art projects he launched at the Earth's poles-- Native Flags, EndangeredWorld and Longitudinal Installation- into self-sustaining efforts to be implemented globally with institutional partners using online platforms. Specifically, “Native Flags” will work with botanical gardens, parks, and native plant societies in community reforestation campaigns. 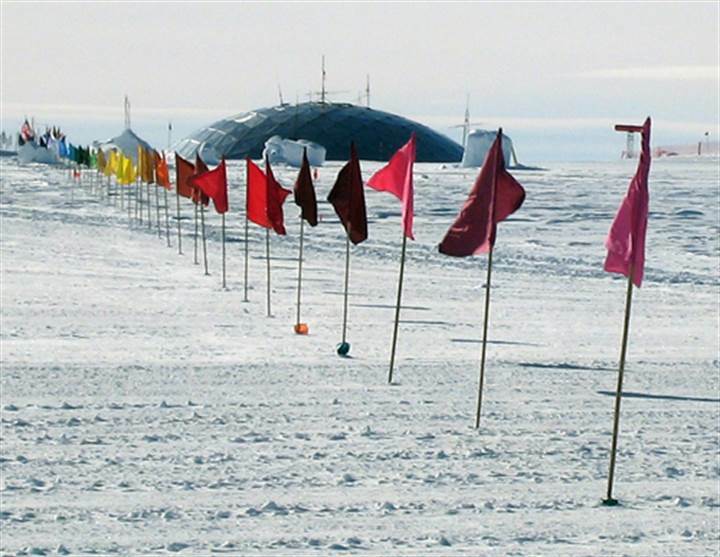 “Longitudinal Installation” will work with science museums and universities to engage others in voicing copncerns about global climate change. “Endangered World” will work with schools and zoos to address worldwide biodiversity loss. Participants plant a native tree next to a green flag at home and ask their neighbors to do the same. Reforestation reduces the greenhouse gases that cause global climate change. 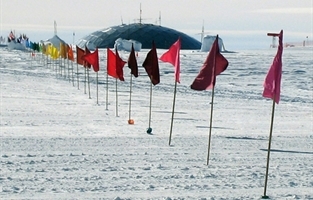 Cortada's "Endangered World" has addressed global biodiversity loss through art installations at the South Pole (2007), North Pole (2008), Holland (2009) and Biscayne National Park (2010) and through online participatory art projects. Select one of the 360 endangered animals featured in the Endangered World project, www.endangeredworld.org. Find a small stone and mark it (paint, carve, write) with the longitudinal degree (e.g., 86E) where the animal struggles for survival. Engage in an eco-action (e.g. plant a native tree) on behalf or your adopted animal. 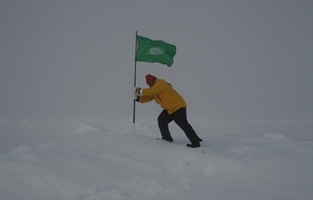 Upload the photo and eco-action on the project website. 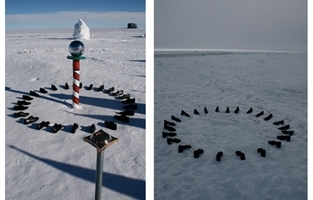 Cortada painted and placed 24 shoes in a circle around the North and South Poles, each representing a person living in a different part of the world affected by climate change. 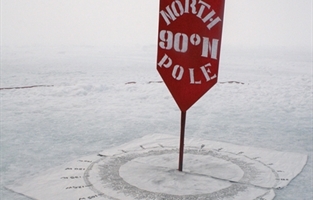 He placed the shoes next to each other along their respective longitudes as a proxy for people in the world below. Cortada went to each shoe and recited a statement from a person living in that longitude about how climate change affected or will affect them. 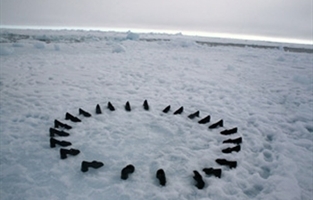 The participatory ritual simply has participants replicate Cortada’s performance by placing the 24 shoes in a circle as the artist did at the Earth's poles. They then read the 24 quotes of those affected by climate change across the planet. Afterwards, participants can think about how climate change has affected their community. They are asked to add a 25th quote, sharing a picture of their own shoe and the change, to keep the conversation going.